Last night, I went to my very first Orange Theory Fitness class at a newly-opened facility. Orange Theory Fitness is a one-hour high-intensity group fitness class that focuses on keeping heart rates in the “orange” zone. They claim this ensures that participants will continue to burn calories even after they are finished with class. Each class changes some, but it is broken into sections including: treadmill intervals, rowers, weights and TRX. When I entered Orange Theory, I headed straight to the check-in counter where I received my heart rate monitor. Since the class is focused on staying in the orange zone as much as possible, everyone needs to wear one. I’m not sure if you can participate without wearing one. After a quick tour around the facility, I put on my heart rate monitor and waited for my friends to arrive. Once the class before ours got out, we headed into the room and chose to warm up on the treadmill or the rowing machine. I picked a rowing machine, and strapped my feet in. *If you are new and aren’t familiar with gym equipment, make sure your instructor knows, so he or she can help you. I didn’t make it very clear and was confused at some points, even though I am very familiar with exercising. After the warm up, my group headed to the weights where we completed three different circuits over the course of the next 26 minutes. We did a variety of squats, TRX moves and rowing. We worked at our own pace within the given time. Mastering the TRX moves was a little difficult for me and others in the class. The instructor could have given us a little more guidance, but she was also instructing those on the treadmills. Once our floor time was up, we cleaned our equipment then hopped on a treadmill to begin a series of climbing and intervals. Treadmills are not my favorite, but I can do anything for 26 minutes. It was difficult for me to stop checking my heart rate monitor, because those are displayed throughout the class. My heart rate monitor felt tight, but it wasn’t tight enough! I ranged from being at 0 percent to 112 percent which was a little humorous but also frustrating. I wanted to know my true heart rate! We ended our class by slowing our heart rate back to a steady pace and stretching as a group. I was a sweaty mess and felt like I had worked hard. I call that a successful workout! I plan on continuing Orange Theory for at least the next two months. Listen to your body! – This is the most important tip. Don’t push yourself too much. Remember, the instructor doesn’t know how you are feeling and what your exercise experience has been like. Don’t be afraid to slow down on the treadmill or even stop if you need to. Bring a bottle of water AND a small towel. It gets really hot in there, and you will be working hard. I don’t know about you, but sweat burns when it gets in my eyes. Bring both of these things to help you stay as comfortable as possible. Make sure the instructor knows you are new. He or she will be able to help guide you through class, so you aren’t confused when everyone started jumping on machines. Wear your heart rate monitor as tight as possible. If you think it is tight enough, it probably isn’t. The treadmill has a fan. Use it! I didn’t realize that until I was already overheated and miserable. Have you ever been to an Orange Theory Fitness class before? What did you think of it? Hello, hello! How was your weekend?! Last week, I left my laptop at home, so I had to take a quick hiatus from the blogging world. But, I’m back now, so don’t you worry. 🙂 I have a healthy recipe and a simple DIY planned to share with you this week, so definitely check back for those. Goodbye boot! You are not missed. Great news! My MRI results showed that I don’t actually have a stress fracture. After nearly a month of wearing the boot, I got to say goodbye to it. Now I am going to physical therapy and doing exercises at home. I’ve only been to one appointment, but my foot feels infinitely better. I cannot believe it, and I am extremely happy! My PT said she’ll have me out run/walking within the next couple of weeks and then I’ll be able to transition back to running. She has me doing bodyweight calf raises and a variety of other exercises, and my calves were on fire the next day. It’s crazy how quickly you lose your fitness, but I know my old fitness level will come back relatively quickly. For now, I’m still going to my swim classes twice a week, and I hope to continue that even after I can run. I keep telling myself that it’s good to get out of my comfort zone! I’ve been using my stress fracture as an excuse to not workout. I know the rest of my body is fully capable of exercise, but I have been slacking. Enough is enough. 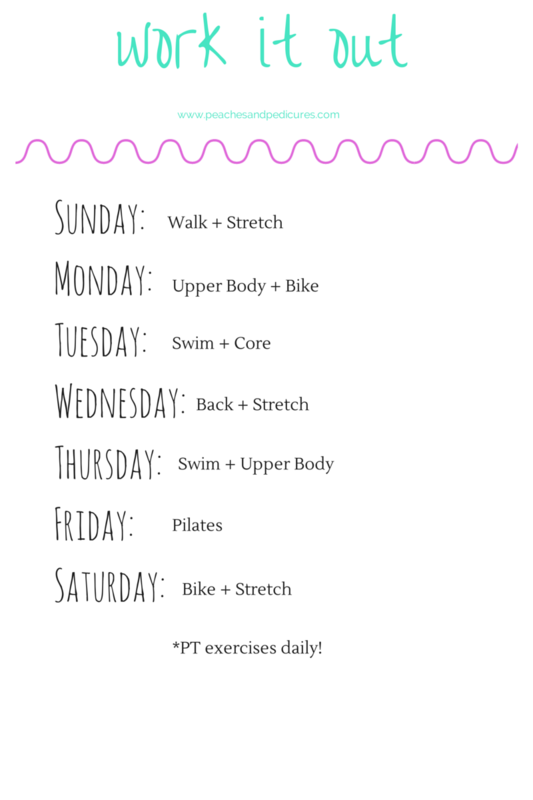 I put together a workout schedule to follow until I get the ok from my PT to start introducing running into my schedule again. My goal with my workout schedule is to get back into the habit of making exercise a priority. I feel so much better when I workout! How do you get back into your workout schedule after an injury or time off (like a vacation)?